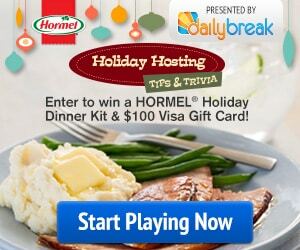 Win a Free Hormel Holiday Dinner Kit and Gift Card! You are here: Home / Sweepstakes and Contests / contest / Win a Free Hormel Holiday Dinner Kit and Gift Card! When you sign up for the Hormel Foods monthly newsletter, you will have a chance to win a free HORMEL Holiday Dinner Kit and a $100 Visa Gift Card. The runner-up winner will receive a Hormel Holiday mini dinner kit for free as well. Register for this newsletter before it ends December 3rd.